Here’s an unsettling fact about cars equipped with air bags: they don’t always deploy when drivers — or regulators — expect them to. Thirteen people have died in crashes involving older GM cars with defective ignition switches. In each of those crashes, and in others in which occupants were injured, the air bags failed to deploy even after striking trees, guard rails or other objects. Puzzled by these failures, federal safety regulators told Congress last month they believed the cars’ air bags should have worked for up to 60 seconds after the engine stalled. But GM has since told The Associated Press that regulators were mistaken: the cars only had enough reserve power to sense a crash and deploy the air bags for 150 milliseconds after the switch malfunctioned and cut off the car’s power. General Motors is recalling 2.6 million small cars to fix the ignition switches. The National Highway Traffic Safety Agency is now scrambling to find out from other automakers and air bag suppliers how their air bags would function in similar situations. Regulators, lawmakers and ordinary drivers are learning what auto engineers already know: These billowing white bags are actually very complex. After a crash, a car’s computer determines, in 15 to 20 milliseconds, where it was hit, what position the occupants are in and whether the 150-mile-per-hour speed of the air bag would do more harm than good. Then it deploys — or doesn’t. Every automaker programs them differently. “It’s very complicated, the logic behind it. It makes it very, very difficult for an automaker or supplier to explain why it did or didn’t go off in a certain situation,” said Joe Nolan, senior vice president for vehicle research at the Insurance Institute for Highway Safety, a group funded by the insurance industry that performs crash tests and other research. 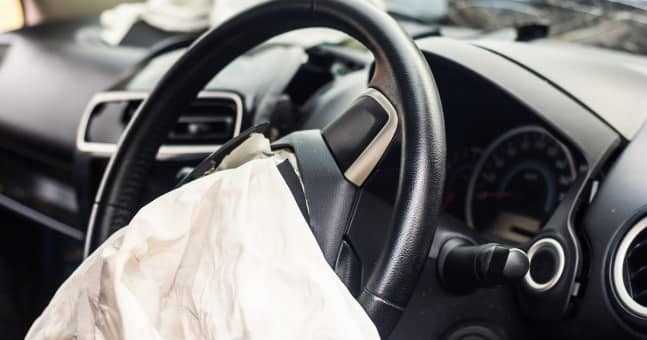 If an occupant is unbelted or very small, or the car is traveling very slowly, the air bag may not deploy because it could cause even more severe injuries. Depending on the angle, the side air bags may deploy but not the front ones. If a car is parked and turned off when it’s hit, the air bags won’t work. GM’s switches created an unusual problem. Because of insufficient resistance, they moved from the “run” position into the “accessory” or “off” position while the car was moving, possibly due to a bump from the driver’s knee or the weight of a key chain. With the switch in that position, the engine stalled and the power steering and power brakes stopped working, making the car harder to control. In a 2006 crash in Wisconsin, a Chevrolet Cobalt traveling at 71 mph suddenly stalled. Two seconds later — outside GM’s 150-millisecond window — it hit a clump of trees. The ignition was found in the “accessory” position and the air bags didn’t deploy. Two passengers died and the driver was severely injured. GM says the air bags in newer cars would work for a slightly longer period of time if the ignition is off, but still less than a second. If the engine had stalled while the ignition was still in the “run” position, the crash might have had a different outcome. In that situation, the air bags, steering, brakes and most other equipment would have had power for up to several hours depending on the amount of charge in the car’s battery, GM said. A report on the crash, completed by a team from Indiana University that was hired by the government, said the air bags may not have deployed because the ignition moved out of position. But the report also noted two other reasons: The trees bent when the car hit them, so the impact may not have triggered the air bags. And none of the occupants was wearing a seat belt. Air bags are meant to supplement seat belts, not to replace them. The report said further analysis would be necessary to figure out whether the air bags could go off if the ignition was in the “accessory” position. Seven years later, that analysis is finally being done. In a statement to the AP, the National Highway Traffic Safety Agency said it is talking to car companies and air bag suppliers about how air bag performance relates to the position of the ignition. The agency says it will take “appropriate action” based on its findings. It didn’t specify what form that action could take, but the agency could make new rules governing how long air bags must work if power to the vehicle is cut. Right now, federal regulations don’t govern when air bags must deploy or how much power they need. Automakers are only required to meet government standards for protection of dummies in a series of crash tests. The lack of regulation is intended to promote innovation. A decade ago, for example, automakers unveiled advanced air bags that determine how much power to use based on occupants’ size and whether they’re wearing seat belts. But that also leads to a myriad of designs that are harder for safety regulators to track. The government may have believed there was a 60-second window because GM tells emergency personnel to wait for 60 to 120 seconds after disabling the power in a vehicle to make sure the air bags have deployed. But that is simply out of an abundance of caution, the automaker said. Click “here” for the original story.